A woman cons two old boyfriends into searching for her runaway son by convincing both that they are the boy's father. Bennie travels to Buenos Aires to find his long-missing older brother, a once-promising writer who is now a remnant of his former self. Bennie's discovery of his brother's near-finished play might hold the answer to understanding their shared past and renewing their bond. Jack: Miss Marquez, I was thinking that maybe if you didn't have anything to do, you might want to go to the dance with me. It'd be really, really fun. Jack: So you wanna go? My mom will drive us. Miss Marquez: Jack, you don't wanna go with me. I'm an old lady. Jack: That's why. That's why I wanna go with you. I can't go with the girls my age, because I look so much older than them. You look just like me. Q: Is there such a disorder and what is it called? 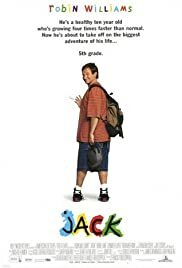 JACK is directed by Francis Ford Coppola and stars Robin Williams in the title role of a boy who ages at four times the natural rate. While somewhat of an oddball choice for Coppola, known especially for the Godfather trilogy, this material is rather characteristic for Williams in this period of his career. Basically, it's a sentimental dramedy that elicits laughter and tugs at the heartstrings. However, this is clearly one of Williams' lesser films. The situation felt contrived and silly, merely an excuse for Williams to engage in puerile antics. What was more astonishing is that this entire film was played straight by everyone. I did laugh some, particularly at a couple scenes involving the physical comedy of Robin Williams playing a 10-year-old in a 40-year-old man's body, but I didn't laugh as much as I would have liked. The moments where they go for poignancy also fell flat a lot of the time, again mostly because of the contrived situation. However, the film is generally well-acted. Of course Robin Williams does a fine job, but Diane Lane and Bill Cosby in particular turn in good performances as well. Jennifer Lopez and Fran Drescher also show up, but more as eye candy for horny boys than anything. 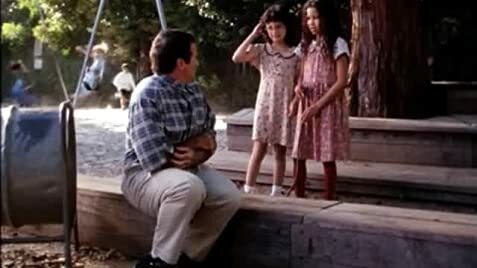 Looking at recent cases involving teachers sleeping with their students, the implications of the scenes involving Jack and those two characters might come off as irresponsible, the subject matter is handled as tastefully as possible (as opposed to something like THAT'S MY BOY, in which Adam Sandler plays a man-child of sorts). I did find one scene between Fran Drescher and Robin Williams as tender, but nothing more. Given the circumstances surrounding Jack's life, you might think that the film goes for a tearjerker of an ending, but it doesn't. Still, I do feel like the closing speech, which sums up the message of the movie, was tacked on and unnecessary to a degree. It was a sentiment better expressed in Williams' earlier movies, such as DEAD POETS SOCIETY. Overall, while still funny and touching in mostly equal measure, the direction was flat and the story was about as inspiring as a Lifetime movie. For die-hard Robin Williams fans (or of Francis Ford Coppola) only. Everyone else would do well to skip it.